If US futurist Thomas Frey is right, in only 12 years drones will be as ubiquitous as cars. Frey says there will be 1 billion drones in use around the world by 2030. What exotic new roles will these combinations of computing, robotics and aerodynamics play in society? Here are a few exciting new ways drones are currently redefining aviation and its purpose. Facial recognition software is set to become a standard feature for drones. Chinese mass-market drone maker DJI has features such as Follow-Me, where the user can identify a target or object on the screen of the App being used to control the drone. Once locked in, the drone will track a target. As it moves, the drone will keep constant its distance and height in relation to the object, with its camera pointed in the correct direction and recording the whole time. The task of following a moving car, a person on a bike or maybe a surfer becomes easy for a single pilot operator. Previously this complex task required two people, one pilot to fly the drone, with a second camera operator controlling the gimbal keeping the camera pointed at the subject. Very clever tech, but what if the subject is a person surrounded by other people? Facial recognition software will solve that. With computers becoming smaller and increasing in power every year it is now possible to include facial recognition software as a standard part of the drone’s capability. 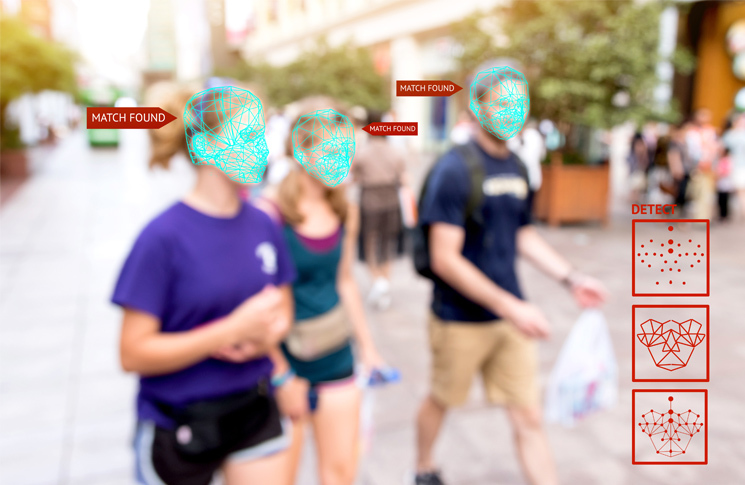 This means it could identify an individual within a crowd and track them personally. The implications are huge and definitely set to revolutionise not just the domestic market but specific sectors such as the security industry. Flying taxis could soon be coming to a sky near you. Multiple companies from different countries are developing their versions of flying cars or ‘taxi drones’ based on multi-rotor aerial platforms. Most adopt the X-8 configuration, consisting of eight rotors mounted on four arms. Each arm has two engines placed directly upside down from under each other in various clockwise and anti-clockwise configurations that cancel out the need for the tail-rotor used by traditional helicopters. This design is used by many heavy lift drones currently in service commercially for payloads exceeding 10 kg. Take that platform, scale up the size, add a passenger cell, and you have a flying taxi. Singapore plans to have flying cabs in service by 2030 and Pang Kin Keong, Singapore’s Ministry of Transport Permanent Secretary has announced talks with tech companies will begin trials for passenger carrying drones. The electric powered Ehang 184, an X-8 drone weighing in at 180 kg can transport a single passenger for around 23 minutes, covering a distance of 16 km and able to cruise as high as 11,000 feet. 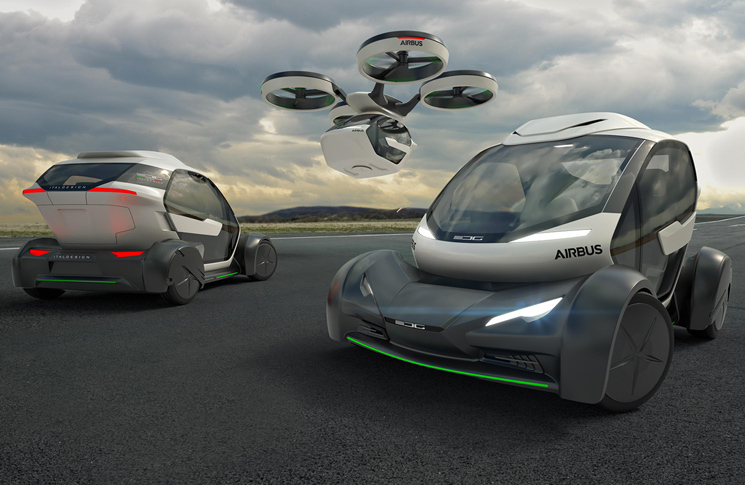 Airbus, car maker Audi and design house Italdesign are collaborating on a modular concept that is both an autonomous electric car and urban aerial vehicle. Unlike some other attempts at flying cars, Pop.Up, first unveiled in 2017, doesn’t attempt to be both these things at once. Its three components are an electrically driven wheel set, a cabin module, and a rotor set that attaches to the top of the cabin. Pop.Up users could begin their journey on wheels, then summon the rotor set—in effect a large octocopter drone—to complete the journey by air, or vice versa. An updated version, Pop.Up Next, was unveiled at this year’s Geneva Motor Show. The system is still purely a concept at this stage, although an advanced one, with weights and dimensions worked out and Airbus doing design work on the latching mechanism between cabin and rotor set. Airbus says it will produce a ‘seamless travel experience’ by offering a congestion free, door-to-door service. Facebook’s Mark Zuckerberg has his own future drone concept in production. Aquila, a solar powered flying wing, successfully completed its first test flight on June 28, 2017. Flying for more than 90 minutes, it stayed aloft for more than three times longer than was originally planned. With an airspeed under 70 knots, the huge lightweight wing is designed to conserve energy and remain aloft for months at a time. The wingspan, larger than a Boeing 737, is fitted with a large array of solar panels, continually recharging the on-board batteries providing the aircraft with its extreme endurance. At a cruising altitude, somewhere between 60,000 and 90,000 feet, the Aquila can fly using only 5000 watts of power. 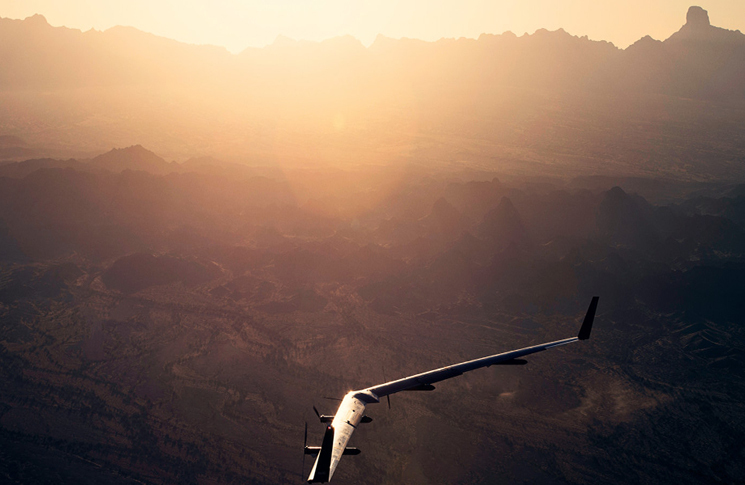 The role of the aircraft is to act as a mobile internet tower, beaming high speed internet to remote areas. It seems artificial intelligence (AI) will play a leading role in the way drones are used in the future. Giving any robot, in flight or ground-based, the ability to think and arrive at complex decisions, all computed at light speed will undoubtedly open up uses for ‘flying bots’ that we haven’t currently conceived. Skycatch, a Californian company, is one of the future tech start-ups using AI and drones for a new purpose. They are building drones that use machine learning to map construction sites, plan out the work, and guide autonomous construction vehicles around the site. At this stage, the drones use programming that allows it to be ‘trained’ by recognising different types of construction equipment through the use of labelled aerial video that has different pieces of construction equipment identified or labelled. These images become the basis for their recognition algorithms to see what equipment is on any given site as they study the overhead footage. From there they can determine where a vehicle is, and where it needs to be positioned, to complete its next task, taking into account congestion and the order of construction events. In the future, the tech will work in with driverless vehicles, diggers, loaders, cranes, etc., moving them autonomously around the construction site, operating seamlessly in coordination yet independent of each other. Angela Sy, Skycatch’s head of AI, told New Scientist, ‘the machines will be able to act on their own, rather than just following a set of rules’. Perhaps you marvelled recently at the opening ceremony for the Winter Olympics in South Korea when 1200 illuminated drones flew in a swarm, creating beautiful moving shapes and images against the night sky. Or perhaps you were nonplussed. But entertainment is just one of the possible uses for swarms of drones. If one drone is useful, how useful would ten or 100 be? Think about search and rescue for instance—finding a downed aircraft or ship missing at sea, a lost person in the mountains, or mapping large areas of land in high resolution. Other uses may be in providing disaster response packages or monitoring large disaster areas. The list is as limitless as our imagination allows. What began with entertainment could save lives. Drones may even replace the motor scooter, electric bicycle, or most commonly, a worn out small hatchback, as the vehicle of choice for delivering fast food. Trials are underway around the world, including in the southern suburbs of Canberra, to see if it is possible, economical, and most importantly, acceptably safe to deliver small packages over short distances in this way. There are a few ifs—battery life, 4G and 5G mobile network coverage, GPS receiver integrity, the ever-present factors of wind and other weather, and of course safety. The business model of commercial drone delivery is large numbers of drones operating autonomously, and by definition beyond visual line-of-sight. 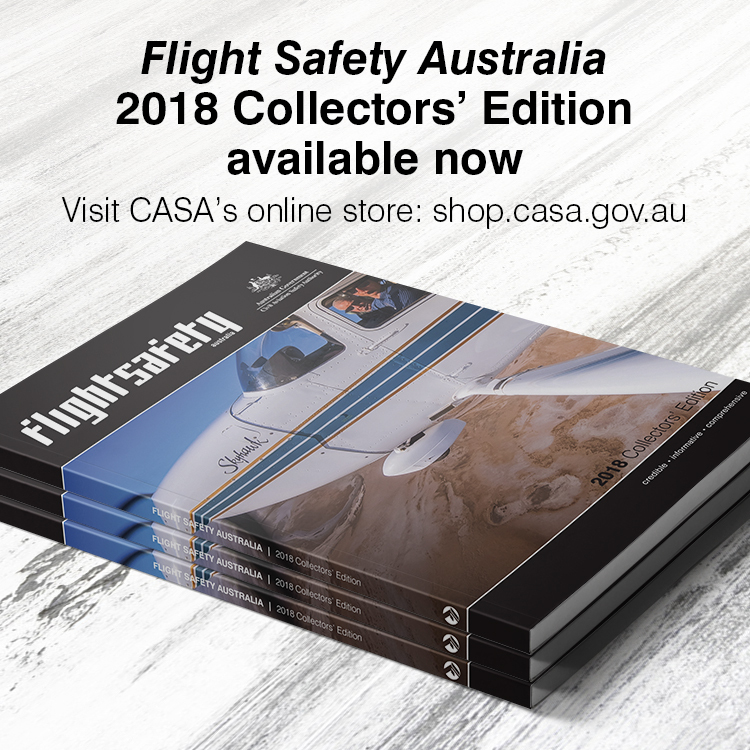 They will have to consistently operate safely around people, vehicles and the occasional low-flying aircraft, such as person-carrying drones. That’s a tall order, which will require mature and tested systems, the development time for which is more likely to be years rather than months. But ten years ago, who would have foreseen swarms of drones charming us, or drones spotting sharks and dropping recue floats? The future of aviation is coming—in a swarm. Not mentioned in the article are likely military uses, from hunter killer AI guided (commanded) fully autonomous weapons systems to seek and neutralize units with facial recognition/biometric recognition tech. It seems clear that ‘drones’ is a transitional label to future robotic systems much more capable of self direction. The machines of even our relatively near future appear likely to be much more than simple, bumb devices guided by a human person. We’ll need a new label to fit the new reality. It’s all very ‘gee whiz’ and it’s coming at us fast – in fact it’s on us now. But it can’t happen without sensible regulation and in Oz we have a regulator that still can’t decide how to regulate manned multicopters, let alone autonomous aircraft. The future will leave us behind if CASA doesn’t get its act together fast. Or, perhaps more likely, the future will arrive and it’ll be like the wild west with everyone doing what they please regardless of the regulator. Oh, what problems are we unleashing for the future! I’m deeply troubled at the thought of a swarm of drones placed precisely at the FAF by those with mal intent. Its only a matter of time before drones feature in a major A/C accident with bodies lying all over the countryside!